Purpose: "To gain a world energy monopoly by eradicating any effective private or governmental competition." The Nth Command pursued that purpose through the creation and use of Nth Projectors. Base of Operations: Secret headquarters below New York City, USA. (Quasar I#51(fb)) - The Nth Command employed operatives known as Nth Commandoes, some of whom used portable Nth Projectors to explore other dimensions. One such Nth Commando encountered an alien being known as a Geometer, and was transformed by it into the Angler. (Marvel Two-in-One I#57(fb)) - Thomas Lightner was hired by the Nth Command to destroy Project: PEGASUS from within, with the intent of gaining the Nth Command a monopoly on all energy research. (Official Handbook of the Marvel Universe Deluxe Edition#3: Deathlok / Deathlok II#32 (fb)) - Deathlok was placed under the supervision of Earth-616's Harlan Ryker at Brand Corporation, an agent of Roxxon's Department M (for "Mutagenics"). 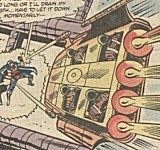 Based on Deathlok's systems, Ryker built an entirely robotic simulacrum of Deathlok. (Official Handbook of the Marvel Universe Deluxe Edition#3: Deathlok) - Ryker's robot was turned over to Roxxon's Nth Command for testing. (Marvel Two-in-One I#53) - Under orders from the Nth Command, Thomas Lightner deactivated security at Project: PEGASUS, allowing Deathlok robot to break in. Lightner referred to this as "Operation Berserker". (Marvel Two-in-One I#54) - The Deathlok robot succeeded in building a portion of an Nth Projector before being discovered and subsequently destroyed by Project: PEGASUS security. In an effort to cover his ongoing actions, Lightner freed Nuklo with the hopes that Nuklo would keep PEGASUS' security busy. (Captain America I#286 (fb) - BTS / Official Handbook of the Marvel Universe Deluxe Edition#3: Deathlok) - Ryker continued to work on the original Deathlok, restoring to fully functional status and reprogramming him to serve them. (Marvel Two-in-One#56) - Thundra and the Grapplers were recruited by the Nth Command to smuggle equipment into Project: PEGASUS. Though they were subsequently caught by security, they succeeded in their mission, and Lightner now had everything he needed to build an Nth Projector. Lightner referred to this contingency plan as "Operation Expurgate". (Marvel Two-in-One I#57) - Lightner's malicious intent was discovered by Project: PEGASUS staff, but too late. However, before Lightner carried through with the Nth Command's plan to use the Nth Projector to place Project: PEGASUS into another dimension, he decided to use the Projector for his own purposes, to restore the powers he once had as Blacksun. (Marvel Two-in-One I#58) - Lightner, now transformed into the Nth Man, was defeated at Project: PEGASUS by the combined efforts of the Thing, Quasar, Giant-Man, Thundra, and the Aquarian. It was revealed that Roxxon was the corporation behind the Nth Command, and that this was only one of many Nth Projectors. (Quasar I#51(fb) & Alpha Flight II#12(fb) - BTS) - Lightner's Nth Projector was initially thought destroyed, but later found and confiscated by Project: PEGASUS. (Squadron Supreme I#7(fb)) - Hyperion (Squadron Sinister) was rescued from imprisonment by the Nth Command and then employed by them to retrieve Thundra. He was promised that if he did so the Nth Command could return Hyperion to his own home world, which he had previously believed was destroyed. (Marvel Two-in-One I#67) - Hyperion brought Thundra to meet with the Nth Command. They showed her a portable Nth Projector, and offered to use it to return her to the home-world she had thought to be destroyed. After seeing how the device was operated, Thundra stole it and fled. Upon learning that it had a self-destruct device which had been activated, she used it on herself, returning herself to her home-world (and Hyperion, who attempted to follow, to the interdimensional void), but not before telling the Thing the approximate location, though not the name, of the Nth Command's headquarters. (Marvel Two-in-One I#73) - Following on Thundra's information, the Thing and Quasar found the Nth Command's headquarters and attacked, but were zapped by an Nth Projector and sent to a prehistoric world. This prehistoric world was serving as an oil production center for the Nth Command--they had set up a huge processing facility and were transporting the oil back to Earth. With the aid of the local natives, Quasar and the Thing destroyed the facility, and then returned to New York via the Nth Adapters, flooding the Nth Command in unprocessed oil in the process. (Captain America I#287 (fb)) - Nth Command scientists combined the remaining organic portions of Deathlok with a rebuilt Deathlok robot. (Captain America I#288) - With the aid of Captain America and a time-traveling clone of himself, Deathlok regained self-awareness and escaped from where the Nth Command was holding him at an abandoned Brand Corporation factory. 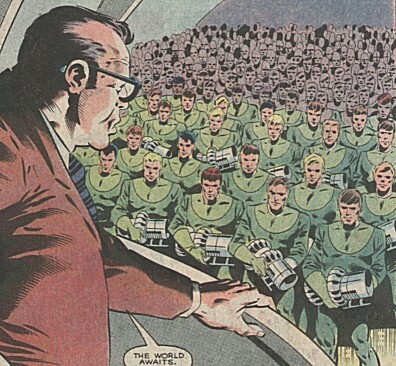 (Captain America I#289) - The Nth Command, headed again by Albert DeVoor, had outfitted a large number of operatives with Nth Projectors. These Nth Commandoes were ordered to use their Nth Projectors to simultaneously attack and remove all of New York's superheroes to other, very fatal, dimensions. This was referred to as Operation Purge. The attack was foiled when Captain America learned of the existence of the plan from Godwulf, a person from Deathlok's alternate future, in which the attack had succeeded and in which Godwulf had been one of the Nth Commandoes. Using information from Godwulf, Captain America gained access to the Nth Command's headquarters, and destroyed the core of the Nth Emanator which powered all the Nth Projectors. The Nth Commandoes carried through the attacks, but with their Nth Projectors not working, the attacks failed. (Defenders I#129) - Professor Power's Secret Empire assimilated members of the Nth Command into their organization, intending to have a new Nth Project on its feet within the year. (Marvel Fanfare II#1) - Operation Purge technology began to be recreated in the now-closed Brand Corporation's facility in Queens. A time-travelling Deathlok (who believed the Red Skull to be behind the project) destroyed the facility and the equipment, despite the interference of Captain America, the Falcon, and Justice Peace. The Nth Command and the Nth Projector were created by Mark Gruenwald and Ralph Macchio. Albert DeVoor was created by Roy Thomas, John Buscema, and Chic Stone. Dr. T.W. Erwin was created by Roy Thomas, John Buscema, and Tom Palmer. The portable Nth Projector, the Scavenger Unit and its skimmer, and the Nth Command uniforms were created by Mark Gruenwald and Ralph Macchio, Ron Wilson, and Gene Day. Bennett Pittman, the Nth Adapters, and Chief Tonah were created by Ralph Macchio, Ron Wilson, and Chic Stone. Lightner's portable Nth Projector was initially thought destroyed (Alpha Flight II#12(fb)), but was later found and remained at Project: PEGASUS until used by Quasar against the Angler (Quasar#51). It was converted into crystal by the Geometer in that fight, but apparently restored when the Geometer restored his other victims (Quasar#52). It was subsequently acquired by the Canadian Prometheus Division (Alpha Flight II#12(fb)), and then stolen from them by Zodiac (Alpha Flight II#12). A prototype portable Nth Projector was subsequently found among the possessions of Imus Champion, and used to deliver Magdalene and the Swordsman to another dimension, and to return the Squadron Supreme home. When last seen that Nth Projector was moved to Project: PEGASUS (Avengers / Squadron Supreme '98). The writer of that issue, Kurt Busiek, reports that it is his intent that Champion acquired the Nth Projector from Zodiac, though that has not been confirmed in print. If true, there's a very nice symmetry--the very same Nth Projector which created the Nth Man who ultimately banished the Squadron from their universe ended up being the very same Nth Projector which restored them to their homes, and both events even occurred at the same location. The Fantastic Four held on to the Nth Command's Nth Projectors; the Angler attempted to steal one from them but was stopped by Quasar and the Human Torch (Quasar I#3). The events of Captain America I#289 serve as the point at which Earth-7484 diverges from our own world. Timestream's existence results of another diversion from near that point on Earth-7484, but it should be noted that the Timestream analog (Henry Akai) of Earth-616 has not yet been seen. 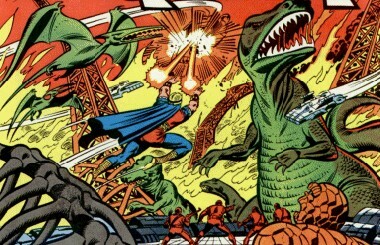 In The Official Handbook of the Marvel Universe Deluxe Edition#7 ("Dinosaur World," inside back cover), the prehistoric world visited by the Nth Command is identified as the same Dinosaur World that was the home of Devil Dinosaur--Earth-78411. In the Official Handbook of the Marvel Universe Deluxe Edition#11, Sidewinder's entry reports that his teleportative abilities come from modified Nth Projector circuitry built into his cloak(s). In the All-New Official Handbook of the Marvel Universe#9, the Roxxon entry notes that the dimensional transporter that Roxxon President Hugh Jones uses in Avengers I#141 & #144 is Nth Projector-based technology. The original Operation Purge, the first attempt to use Nth Projectors to eliminate all superhumans, is very clearly stated to occur in 1983. This date is topical. The quote in the Nth Command's "Purpose" (above) is from Marvel Two-in-One#58, p31, pan8. The Nth Emanator and Nth Commandoes were created by J.M. DeMatteis, Mike Zeck, and John Beatty. In point of fact, they did offered to return him to his original home, and Hyperion believed them. Whether or not they could have delivered on that promise is another matter, but they did in fact offer it. Given an infinite number of alternate universes, it is very conceivable that they could have found a Yttrium so close what Hyperion believes that he wouldn't notice a difference. Following up, it should now be noted that as of New Thunderbolts#15, it has been established that there was indeed a real Hyperion and a real Yttrium upon which the Squadron Sinister Hyperion was based. Miskatonic University came from the 1922 serialised story "Herbert West: Re-Animator" by H.P. Lovecraft, and he used it multiple times thereafter. anyone or anything else with a similar name. anyone or anything else with a similar name, or any other "Chief"s.
or to any other dimensional transport devices not mentioned here. Albert DeVoor claims to have been a scientist developing theories of alternate worlds when, on the verge of failure, he was approached by Arkon, who was attempting to foment a war between three worlds: ours, the Fifth Dimension, and Earth A. Acting as an agent for Interlocking Technologies, Unlimited (I.T. ), DeVoor purchased controlling interest in the Fantastic Four's technology, and also purchased technologies in the other two dimensions. When the Fantastic Four foiled the plot, I.T. presumably went out of business. When next seen, DeVoor had become the director of the Nth Project. He was briefly transported to Earth-8009 in the company of Abner Doolittle and Dr. Erwin, but was subsequently retrieved. He was later placed in charge of Operation Purge, the attempt to purge Earth of all super-heroes through use of an Nth Emanator. Some time later DeVoor used Interlocking Technologies to start a vacation business with his Earth A counterpart. They sent Earth A residents with superpowered counterparts on Earth B (Earth-616) through an Atomic Resequencer to Earth-616 to give them the powers of their Earth-616 counterparts. DeVoor greeted the empowered Earth A residents on Earth-616 and gave them all the info they needed to know about their counterpart to prevent any problems. The plot was discovered and DeVoor got into legal trouble for participating in Secret Identity theft. DeVoor and his clients received help from Goodman, Lieber, Kurtzberg & Book. All captured clients were eventually sent back to Earth A by DeVoor and Mr. Fantastic, who couldn't understand why he let DeVoor keep the technology in the first place. Bennett Pittman was a troubleshooter on Roxxon's floating oil rigs before being given the opportunity to preside over the Roxxon's extra-dimensional oil drilling and processing facility. After the facility was destroyed, Pittman was captured and arrested. The Nth Command's first extra-dimensional base was an oil processing facility on a prehistoric world (Earth78411/Dinosaur World) which had both dinosaurs and primitive men living side-by-side. The natives were made to serve for "years" by means of vague promises and threats, but did not hesitate to rise up in revolt at the side of Quasar and the Thing. Chief Tonah was the native tribe's leader. Tonah and most of the native tribesmen spoke both their own language and English (which they learned from the Nth Project workers). The native tribe was at a very primitive technology level (spears and clubs), but did harness and ride the dinosaurs. The Nth Projector was a device capable of transporting materials into other dimensions. Nth Projectors came in various sizes and strengths, depending on how much material is to be transported. Nth Adapters were the largest known Nth Projectors. They served as a permanent conduit to transport oil from one dimension to another, and had an internal diameter of about six feet. Quasar theorized that Nth Adapters were fitted with failsafe devices, to prevent accidents resulting from transporting unexpected quantities of material. Portable Nth Projectors were approximately three foot long, and heavy enough that they were generally transported on a handcart, though a person could carry one with minimal difficulty. These portable Nth Projectors could be fitted with homing devices and remote controlled self-destruct devices, to prevent their theft. The Nth Projectors wielded by the Nth Commandoes were lighter and smaller, but required the existence of an Nth Emanator to operate--an immensely large power source. It is unknown what the range of a Nth Emanator was, but it was at least the distance from New York City to the X-Men's Mansion in Westchester in upstate New York. When the Nth Emanator was destroyed, the Nth Projectors all failed to function. The smallest known Nth Projectors were incorporated into Sidewinder's cloak, allowing him exceedingly limited teleportation. The psi-null field generator was a device capable of blocking mental powers at a distance. The Nth Commandoes believed it would be capable of blocking Professor X's mental abilities, though its effectiveness remains to be determined. The Skimmer was a jet powered manned transporter. It flew at high rates of speed, and could hover as well. It could be equipped with a variety of weapons, including electrified titanium nets anchored with gravi-pods (whose weight could be adjusted from the skimmer), gravimetric beams (effectively tractor devices), blasters, gas grenades, and metal grappling coils. Each skimmer was manned by a four or five person "scavenger unit."